a wonderful villa between beach and hill, near Nora archeological area. 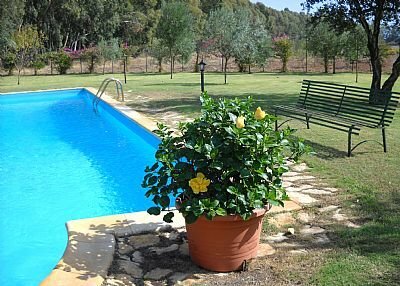 Swimming pool, olive and fruit trees, vegetables garden. Pula town is really nice and well known, with its white sandy beach (SantEfisios, 15 minutes driving from the apt), the archaeologic area of Nora, and its Piazza with the cafès and summer theatre and music. At 10 minutes distance from the apt there is the Is Molas Golf Club, at 20 Km distance the Chia Laguna beaches and lagoon. The ancient city of Nora is positioned on the furthest point of Cape Pula, in front of Pula town, surrounded by the sea, connected to the mainland by a tiny isthmus. Thanks to the ancient traders Nora was developed into an unique and important point for the entire Sardinia isle. The name of the city is derived from the root word “nur” the same as that wich has been used for the ancient prehistorical Sardinian sites, the “Nuraghi” towers. In fact, many megalithic stones were discovered at Cape Pula and were later utilized for the Nora city’s buildings. Nora’s story began during the early 8th century B.C., when the Phoenicians, sailors and traders from the Mediterranean, decided to use that site as one of their first strongholds on the Sardinia island as confirmed by the most famous and ancient written document ever discovered in the Mediterranean, the “Stele” of Nora. Around the 6thcentury B.C. the Punics, inhabitants of Cartage city, located in the North African coast (now, Tunisia) were seen for the first time around the coast of Nora. It was during that period that the city of Nora really began to take shape: sacred buildings on the higher slopes and around the foot-hills, the residential and commercial districts, an extremely large number of water and storage tanks. It is from that moment on that Nora really became an important reference point for the commercial traders crossing the Mediterranean. However, it was during the Roman period, from the 227 B.C. year, that Nora reached the peak of its expansion and development. Some of the original Punic buildings were destroyed or modernized by the Romans. During the 1st century ad, Nora officially became a roman Municipium, and lot of monumental buildings were erected, most of them still visible today: the Forum, the teathre, four thermal baths, temples, huge mansions and villas, the insulae, the aqueductus and, last but not least, the amphitheatre, wich unfortunately has been destroyed. During the 5th century a.c. started the Nora decline, the Mediterranean coastlines became dangerous and Nora, as the other coast cities of Sardinia, became prey of the devastating strength of Vandals then, during the 8th century a.c., the Saracens violently attacked burning the city almost to the ground, forcing the remaining inhabitants to flee towards the inland areas, where they gave birth to the new village of Pula. The defense tower on the peak of Coltellazzo was built during 1595 from Spanishes, as part of the Sardinian coast protection program. at 15 minutes distance driving from the apt there are the Gutturu Mannus mountains and forest (the larger forest of Sardinia) where you can have a walk and see and hear, expecially in spring, deers and wild boars.